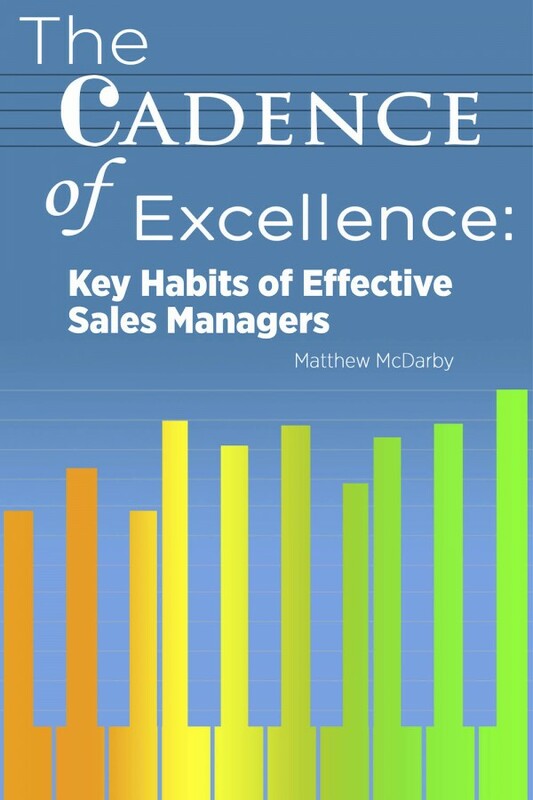 Matt McDarby’s new book, “The Cadence of Excellence”, is an outstanding book that every sales manager – and those who manage sales managers – should read. The book includes many real-life examples of leading companies that have refocused their sales managers toward a new, early stage and value-creating operating system. According to the author, the core problem that sales managers face is that, under huge pressure to deliver revenue, sales managers are too often pushed by upper management toward the latter stages of the sales process – by organizations that believe that closing deals is the best use of a manager’s time. The Cadence of Excellence makes a strong case that organizations that push sales managers to close more deals implicitly endorse poor selling practices, reminiscent of the “Always be closing” line from the movie Glengarry Glen Ross. Effective sales managers understand that while there will always be times when their help is needed in a late-stage opportunity, their real job is to focus on appropriate prep work at the earlier stages so that these fire-drills are kept to a minimum. What conclusions do I want this salesperson to draw from our next coaching conversation? What questions do I need to ask that will lead him or her to that conclusion? What commitments do I want the rep to make next? McDarby, a former VP of Sales at Huthwaite, advises sales managers that their critical function is to help reps see problems they didn’t know they had, opportunities for improvement about which they were previously unaware, and solutions they could not have created on their own. And so…. coaching is like selling. It hinges on a manager’s ability to influence another’s thinking. Every sales manager has spent years developing these kinds of skills: we just have to make better choices about how we apply our time with our reps. Hey sales managers – you can do this! The Cadence of Excellence provides thought-provoking content, real-life examples, and proven guidance on how to be a great sales manager. Everything I like in a book!